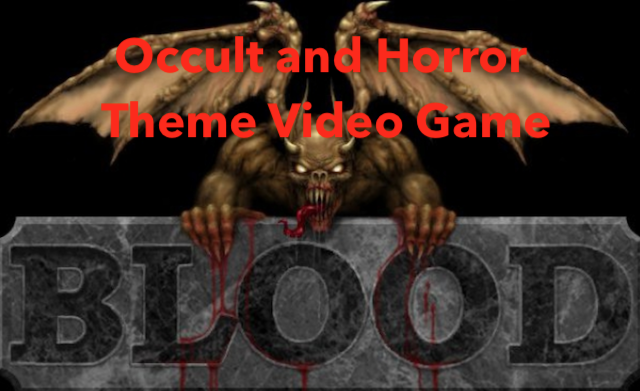 Classic Video Games Review  Blood : Occult and Horror Video Game. [Recall Memories with Classic Games]. Hallo Steemians! How are all doing today? Back again with me @zulman with another review of old games that was release for MS-DOS platform and before the year of 2000. This game in particular that I am going to review was released in 1993. The reason that I am reviewing these all old game is that I want to experience what the game is like. I do not play a lot of game when I was a kids. So, with this review, I want to experience those old games now. As usual, at the end of the article, I will give you all the information about how to play the video game that I am reviewing. Also, i will tell you how to install the game on your current PC or Mac or or if you do not wish the difficulties of installing the game, I will also give you information where you can play the game online. There are many website that provide so many old MS-DOS game. This review going to be about the information of the game, I will also provide some screenshots in order for you to see how the game is look like. Then, at the end of this article, I will also give you the information how to play this game on your current computer or where you can play this game if you want to play it online. Alright, let's begin the review of the game. 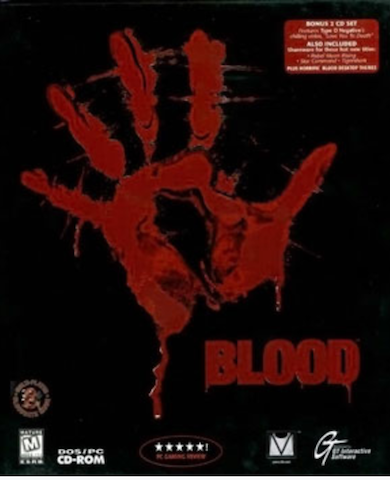 Blood video game is a video game that belong to a first-person shooter video game that was released in 1997. The video game was developed by Monolith Productions. There is also a shareware version of this game that was released in March 1997. While the full version of this game was released on May 31 for North America market and June 20, in Europe. This game was published by GT Interactive Software. In term of the story line, this video game tell a story about an undead gunslinger in early 20th named Caleb. Caleb is seeking revenge against the dark god named Tchernobog. This video game feature a lot of occult and horror theme. In this video game, there are also a large amount of graphic violence included. Yes, this video game was belong to the violence side. Beside that, this video game also feature lot of large weapons that are from standard weapons to bizarre class weapons. The player also need to fight numerous of enemies and bosses. This video game has become a franchise. There were sequel of this game entitled Blood II: The Chosen. This sequel was released on October 31, 1998. The franchise of this game itself was continued with two official expansion packs. These expansion pack named Plasma Pak, that was developed by Monolith and another one entitled Cryptic Passage, that was developed by Sunstorm Interactive. Later, the video game was released on GOG.com in April 22, 2010 along with the two expansion pack. Blood is one of the earliest FPS games to feature alternate or secondary attack modes for its weapons; most weapons in Blood have two different modes, whereas weapons in previous FPS games usually had only a single type of attack. Blood also has "super secret" areas which are very hard to find or reach and contain large rewards for discovering them. This video game support for single-player and multi-player. In single-player mode, the player of the game will play the role as undead gunslinger named Caleb. Caleb has quest in order to take revenge against his former master. In order to finished the quest, the player need to navigate through a lot of level in each episodes. The objective is to find the exit until the boss of the level appear and the player must defeat the bosses and large number of enemies. Blood video game's gameplay is very similar to another classic FPS game such as DOOM. In the game, the player need to activate switches or find keys in order to go to the next levels. However, in some of the maps, there are more than one keys that the player need to find. The feature in this game that available to help the player to navigate the maps are teleporters. There are also features that will prevent the player navigate the maps successfully such as crushing blocks, explosive barrels, lava pits, jumping puzzles and combination lock doors. Beside the feature above, there are also a lot of items available in the game. These items such as Weapons, artifacts, and also bonuses items that appear. For Firearms, this video game inlcudes a flare gun, sawed-off shotgun, and Tommy gun. There were also explosive weapons such as dynamite and napalm launcher. A shock rifle also available and there are also some of magic artifacts including Voodoo doll and aerosol canister that can be used as flamethrower. The video game also features a power-up. This power-ups known as "Guns Akimbo", with this power-ups, the player will be able to wield dual weapons temporarily. In Blood, like other FPS video game, it also feature multiplayer modes. This multi-player mode will be played as the classic deathmatch game. In blood, this match was known as "Bloodbath", and as cooperative play. Bloodbath can be played on a special map that was particularly design for it. While Cooperative gameplay is following the lines of the single player campaign. This mode is allowing several players to work together in the levels from each episodes. Check this picture below to see how the game look like. My opinion about Blood video games. This video game is a very fun game to play. The game has a certain feature that make it a unique video game to play. There are a lot of weapons to choose from in this video game. Although I personally do not like the occult and horror theme in this video game. This video not going to be on my classic game list for day to day play. But, for those of you who like horror theme, this video game is very good. The game that you download will come in an archive, you need to extract it and then run it with DOSBox. You can find how to run the game inside DOSBox below. Unpack the blood.zip file that you downloaded before. Navigate to the game folder that you have extracted. Execute INSTALL.EXE to install and play the game. If you do not want to waste time or just simple do not like the difficulties of step that you need to do install the game to your computer, do not worry, you will still able to play this game online without installing it. Check out the link below to the website where you can play this game online. Note: The sequel of the video game entitled Blood II: The Chosen + The expansion also available on Steam. Click here to check out the game on Steam. I played this game so much throughout my childhood and even as an adult I continued to do so. One of my favorite pc games back then! Thanks for visiting my blog @tsukuyomi. Glad you like the review.